Ernest Hemingway wrote that courage is grace under pressure. Barry Spano had that grace in spades. After all, he’d been a combat helicopter pilot in Vietnam at a time when approaching a “Hot Landing Zone” often meant being shot down. In fact he was wounded in action. The public always heard that the helos typically dropped off troops or rescued them; they weren’t aware how very many crews were killed in the process. As an Air Force medic stateside, I had a pretty good idea…. Years later – and years ago now, with his private airplane pilot’s license, Barry was in a life-threatening airplane crash. The passenger, his brother George, walked away. But Barry was badly injured, crippled, and his face forever re-arranged. Mind you, Barry Spano was not just the sparkler that most newer Norton members knew him to be. He was a handsome devil much beloved of the ladies. Well, not long after his scary-looking “halo” splint and other medical gear were removed and he could (sort of) walk again, I was surprised to encounter Barry at a costume party. I’d have thought he wasn’t up to socializing…. But what surprised me more than his turning up – and what I’ll never forget – is what he wore. It was heart-breaking. And inspiring. Barry was in a harlequin get-up, with the colorful suit, the tri-corner floppy hat with bells on the ends and the shoes with the long toes that curled up at the ends. The Court Jester. Or maybe he was trying to look like Quasimodo, the deformed bell ringer and “King of Fools” in the classic “Hunchback of Notre Dame.” Anyway, not only did he attend the party at a time when his face was still scarred and, let’s just say, asymmetrical; the costume attracted even more attention to himself. Barry had a hell of a good time from everything I could see. But of course there was much I couldn’t see. I was so moved by this remarkable, simple display of courage that when I got home I almost lost it. Barry was one of those elves in human form who keep laughing through multiple hurts, physical and otherwise. And who at the same time make us laugh – at all the world’s craziness, at our ideoscycracies and foibles. And, yes, weaknesses. They’re the ones who help the rest of us “deal.” Fate has kind of drawn them that way – and bless ‘em for it. The last thing they want is for us to feel sorry about them. Rejoice WITH them, party with them is more like it. Really, the world’s Barry Spanos are the best kind of teachers, since they don’t rely on lecturing, heavy-handed value judgements or psycho-babble - but on turning life itself into the object lesson, reveling in it in all its shadings dark to light. But especially the light. Who can forget that huge, drawn-out, contagious laugh of his! That alone spoke volumes. We’re here, all of us, such a short time. And with Barry as with others who suddenly drop away from our worlds, it’s more than a cliché to say you don’t know what you’ve got ‘til it’s gone. Well, as some of you know I’m not bent like Barry. He was the blue flame so to speak. I just looked on in amazement at his “performance art” and tried to follow his verbal light shows. But he taught me many lessons anyway: about life and really enjoying it, about keeping things in perspective, about not sweating the details, about the uselessness of holding grudges. And maybe most of all about the importance – and dignity - of keeping my chin up in hard times. Lessons no one’s ever too old to absorb. Barry was eccentric like all of us - hell, we’d rather balance of two wheels than four! But he was more. In the 30 years I knew him, I always thought of him as a fellow traveler (or maybe even the reincarnation) of the beatnik poet Jack Kerouac. Bart Spano was our fireworks display. It’ll be a duller place by far without him. Rest in peace, my friend. Died on August 25, 2004 in the District of Columbia at his home in Palisades after a long struggle with cancer. Known by family and friends as "Barry" or "Bart", Mr. Spano was a helicopter and fixed wing instructor and commercial pilot and formerly worked for Henson Aviation as a staff pilot. Mr. Spano was a graduate of Bethesda Chevy Chase High School 1964 and enlisted in the United States Marines in 1966. He received his military training at Parris Island and then at Roosevelt Roads, Puerto Rico where he earned a sharp shooter medal and became a certified air frame and power plant mechanic. He then transferred to the Army Flight School at Fort Rucker, Alabama. Mr. Spano served in Vietnam in 1969 where he served as a helicopter pilot and flew dozens of missions over South Vietnam. He was wounded by enemy fire in the performance of his duty while evacuating wounded under combat conditions. For his extraordinary efforts he was awarded the Purple Heart. He then was restationed to Ashaffenburg, Germany, and entered the Reserves in 1972. In 1975, he received a Bachelors degree at the University of Maryland and was discharged from the United States Army Reserve in 1986. 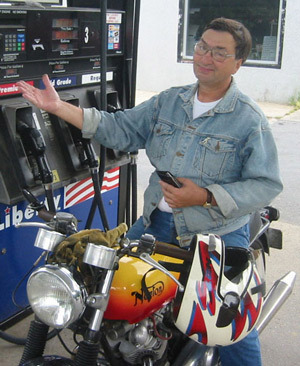 Mr. Spano was an avid motorcycle collector and member of the Washington, D.C. Norton Motorcycle Club. Survivors include his mother, Pari; siblings, Diana, George, Stephen and Victor and nieces, Madeline and Jessica. Services private.